Tsering Wangchok, District Panchayat Officer graduated from MAM College, Jammu. He worked as a teacher for three years and was appointed as Village Level Worker in the year 1999. Later, he was promoted to Panchayat Inspector after which took charge as Block Development Officer, Panamik. 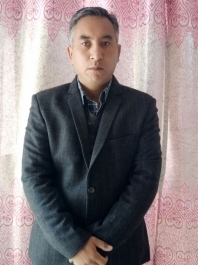 In the year 2013-14, he served in Kargil as Block Development Officer, TSG and Drass for four months after which he took charge of Block Development Officer, Leh. At present, he also holds the charge of BDO Leh, Saspol, Chuchot. Q. What is the role of Rural Development Department, Leh in Panchayat elections? Rural Development Department involves in the upliftment and development of the rural areas by implementing various centrally sponsored schemes and the state government schemes in the rural areas. Panchayat is a very strong and important system in the society and the very aim of the Panchayati Raj institution is to tackle the overall development at the grassroots level. A proper election is conducted after every 5 years to elect the new representatives at every Halqa. To conduct the Panchayat elections, District Panchayat Office assist District Panchayat Election Officer (Deputy Commissioner) in revision and updation of electoral rolls, placement of officials/officers on election duty during the election days, getting down all the materials and necessary arrangements. Q. Tell us about the Panchayati Raj system in Leh and when the system was implemented in Ladakh? The Panchayati Raj system under J&K Panchayati Raj Act 1989, there is a 3-tier system which includes Halqa Panchayat, Block Development Council and District Planning and Development Board at Panchayat, Block and District level respectively. In every Halqa Panchayat, a number of Panches not less than seven and not more than eleven including the Sarpanch is needed. The Government has transferred 14 departments to panchayat vide Govt. order No: 1126-GAD of 2011 dated 22/09/2011 for implementing the schemes of the departments at panchayat level effectively. Besides, the LAHDC, Leh empowered the halqa panchayat by allocating ₹3.00 Lakh every year per Panchayat out of district plan. Recently, under 14th Finance commission, the fund is also transferred in panchayat account for planning and implementation of various works. Besides, all the schemes of Rural Development including MGNREGA is planned and implemented at the panchayat level. The Panchayati Raj system in Leh is working effectively but not as compared to the other states where it is functioning very successfully with all powers and facilities. Over the decades, this institution has been proven very beneficial for the people including women in terms of new economic opportunity, social security and equal say in decision making power. Q. How many Halqa Panchayat are there and brief us about its establishment and constitution? In Leh district, we had a total of 93 Halqa Panchayat but in the past years we worked on creating more Halqa Panchayat and the proposal for the delimitation have been sent to the government. Out of the few proposed area, we got an approval for the Kharnakling and Pharka because of the population. Talking about the establishment and constitution of Halqa Panchayat, there shall be a Halqa Panchayat for every Halqa where it is headquartered. Every Halqa Panchayat shall have majlis comprising of the entire person whose names are included in the electoral roll for such Halqa Panchayat. Every Halqa Panchayat shall consist of a number of Panches not less than seven and not more than eleven including the Sarpanch. It is also prescribed that the Sarpanch shall conduct at least two meeting of Halqa majlis during a financial year. In the previous years, the Sarpanch was elected directly by the electorate of halqa Panchayat and the Panches shall be elected from the constituencies. But from this year, some changes are made in the process of electing the Sarpanch. The Sarpanch which was elected directly will now be elected among the Panches. The panchayat will hold the office for a period of five years. Q. What is the role and responsibility of Panchayat? How important is it to have local governance? Panchayat, the grassroots level political institution role is to prepare the plans for the development of Halqas and to undertake measures for the development plans. It also implements many schemes of various departments to eradicate poverty and generate employment. Local Governance plays a very important part in the system. It is the most accessible level with the other system for the majority of the people. It is the channel closest to the people at the grassroots level for accessing basic services and facilities, participation in the public decisions for exercising people’s right and obligation. Q. What are the advantages and disadvantages of having Panchayat and Hill Council? Is there any difference in the working styles? The Panchayati Raj system under J&K Panchayati Raj Act 1989, there is a 3-tier system which includes Halqa Panchayat, Block Development Council and District Planning and Development Board for the Panchayat, block and district level respectively. This was initiated to decentralize the planning process and carrying out of various developmental activities for rural upliftment through participatory management process. But in case of Leh district because of the Hill Council existence, the work of the District Planning and Development Board system is looked after or functioned by the Council. There is no separate body of District Planning and Development Board. Hill Council is a district level governing body whereas the Panchayat works at the grassroots level. Both the representative work in coordination for the development of their areas. Q.What is the election process of a Panchayat? A person can represent himself/ herself as a candidate for the election of Panch or Sarpanch of a Halqa Panchayat if his/her name is included in the electoral roll of that particular Halqa Panchayat. The candidate should be above 25 years, permanent resident of the state, should not be a government employee, should be of sound mind and state, no criminal records, and should not be a Nambardar. At first, the Panch members are elected, after which a Panchayat Secretary convenes a meeting and the Sarpanch is elected from the newly elected Panchs. The Sarpanch is elected within 15 days after the Panch election. For the upcoming election, there are 95 halqa panchayats and 687 panch constituencies in Leh district. Q. Brief us about the importance of Block Development Council. Block Development Council is the one among the part of 3-tiers Panchayati Raj system. It is constituted at every block bearing the name of the block and should consist of Chairman, Sarpanch of Halqa Panchayat falling within the block. The system is not yet implemented in the state because the 3-tier System becomes incomplete without the existence of it. It is very important because the work will be monitored by the chairman which is otherwise carried out by the Block Development Officer. A separate office will be set up in which officials from the various department will be represented. This will help in carrying out the developmental work more effectively. Q. The state government passed a law in 2003 reserving one-third of seats (33%) under the J&K Panchayati Raj Act 1989for women in these grassroots level political institution. Do we have equal participation from women in Ladakh? Reason. To ensure greater participation in managing the affairs of the grassroots level democratic institution, the reservation for women in Panchayat system is made. Women of Leh have been very active at the grassroots level, the participation is more as compared during the gatherings, meeting, functions. So far, we had only one woman Naib Sarpanch from Stok Halqa. The representative of woman has been limited till Panch members only. Q. How can we encourage active women participation in Panchayati Raj system? The one-third of the seat reserved for the women for the Sarpanch as well as Panch is one of the very encouraging steps initiated by the Government. This ensures women to take part in the grassroots level political institution and make their presence in the society. Seat reservation for women under the J&K Panchayati Raj Act 1989 has helped immensely in bringing women in the political spectrum, involvement in every grassroots level activities and in the implementation of government schemes and to raise voice against women related issues. There is a need of awareness and encouragement at the local level to make them stand and lead. Also, I would like to stress on the importance of young educated youths to participate in such system actively to bring positive changes in the society. To develop the rural society in a real sense, coordination at all levels need to be strong and active to take the entire necessary step effectively and efficiently.